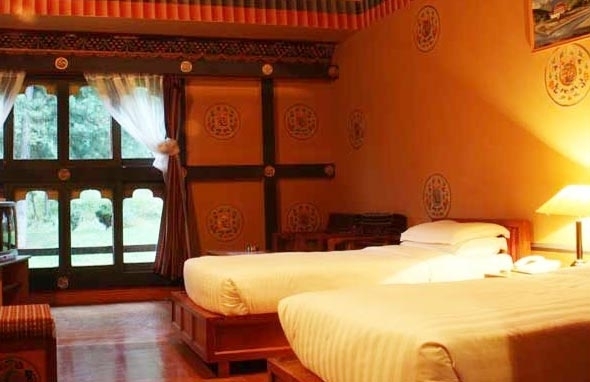 Amid 11 hectares of pine forest overlooking Paro Valley, this laid-back hotel is 9 km from Paro Airport and 12 km from Taktsang Lhakhang, an iconic temple built on a cliff. The warm rooms and suites provide Wi-Fi (fee), cable TV, and tea and coffeemaking facilities. Some have wood-paneled walls and/or living areas with sofas. Cottages add balconies offering valley views. Room service is available. Amenities include a vegetarian restaurant and bar offering views of the temple, plus a spa and a hot stone bath.